An “info-nerd” in California has translated data from the US Census Bureau into a map of the racial/ethnic divides in 40 American cities. On an overlay of each city, Eric Fischer has placed dots of varying colors, with each dot representing 25 people. 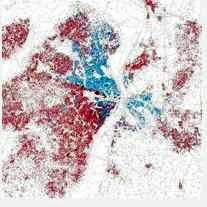 According to the St. Louis Riverfront Times, “the red dots represent people who self-identified as white, blue dots for black, green for Asian, orange represents Hispanic and gray is “other.” You can draw your own conclusions about each city, but the overall impression is that we’re still living in a very racially and ethnically segregated country. Scrolling through Fischer’s maps yields a look at American cities through a colorful prism. The dotted view of some cities is rainbow-like, while others are quite monochromatic. Looking at a city you’re familiar with, you can see the striking neighborhood dividing lines. Fischer’s project includes: Ann Arbor MI, Baton Rouge LA, Hartford CT, Jackson MS, Knoxville TN, Laredo TX, Little Rock AR, Miami, FL, Newark NJ, New York City NY, Orlando FL, Portland ME, Providence RI, Reno NV, Rochester NY, Salt Lake City UT, San Bernadino CA, Washington DC and many more. Entertaining, enlightening, discouraging and worth a look. Previous Post:Do we really need 11 aircraft carriers?